This is particularly so if technology has any sizable part of your life. Just when you think you’ve got it all together. Just when you think things are going well. Just when you think you know exactly where you are heading. Suddenly there’s a curve. Suddenly there’s a hill. Suddenly your clear vision’s obscured. That’s change. Problem is, we all need to have a role in change. Some people drive change – like the YouTube co-founders that just converted their 20-month old website into a US$1.65B windfall. Some people are early-adopters of change and end up leading a huge band of followers of change. Some people only change as a very last resort – when they absolutely have to. Then unfortunately, some people never change. And we have to live and work with all of these types of people. It’s no wonder true change is so difficult to achieve. Parallel Divergence is my small tangible effort to facilitate certain aspects of voluntary change with some of those people I come into contact on a more regular basis. It’s all about critical thinking. Different people have different ideas about all aspects of life. By raising various topics here, I hope to put across a point of view – right or wrong. By adding your comments, maybe you can help me and others change as well. And finally, there’s Brad & Phil, a cartoon series that grows as each major article is posted. 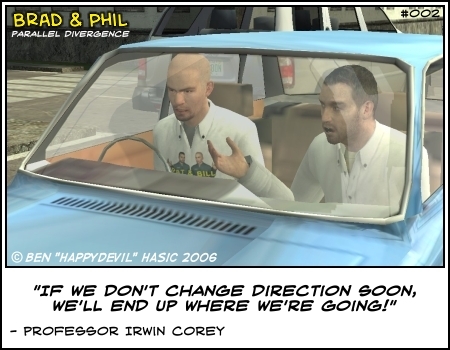 Brad & Phil are exclusive to Parallel Divergence courtesy of Happydevil Comics. This is a great article, we all need changes some way or the other. I don’t know how i could help you change but i know change for the better is good. From the core of Heart.